I’m going to step out on that proverbial limb and talk about a controversial subject: holding tank treatments. It seems that everyone has a favorite toilet chemical. They are also certain that the inferior substitute you are using is nowhere near as cheap, effective, safe or easy to use as their favorite. Okay, I’m joking—a little. If you ever want to start a lively discussion around a campfire, ask what your neighbors are using for their toilet! 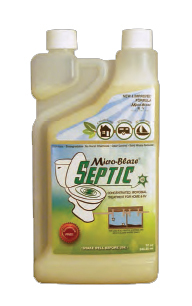 When I was approached by, Lawrence Heyman, Micro-Blaze’s independent manufacturer representative, about the use of Micro-Blaze Septic RV Tank Treatment, I was somewhat skeptical. I received several samples and asked a few fellow Escapees to give it a test. It only takes about one ounce per tank to be effective, so it is quite economical. This product is a tailored bacterial treatment that aggressively targets grease, oils and solids, so it’s effective in both black tanks and grey tanks. After several months, the test users reported excellent odor control, and some also claimed that the product cleaned up their tank sensors and got them working again. That is simply amazing in my experience! (My RV has external tank sensors that aren’t affected by tank gunk, so this is why I solicited others to test the product.) According to the manufacturer, the all-natural microbes attach to any solid in the tank and eat it away until it’s gone. 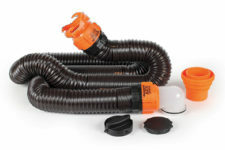 Over a short period, this removes the deposits that keep the tank sensors from working. I was so impressed with this product that I suggested the club order the Micro-Blaze septic tank product for treating in-ground septic systems. We are currently testing it at Rainbow’s End.